People having opinions about “Visual Kei” must have forgotten about the 70´s-80´s “Glam Rock, New Romance” and “New Wave” when the hairspray formed into a thick fog and mascara had a tendency to “disappear” from moms or girlfriends. 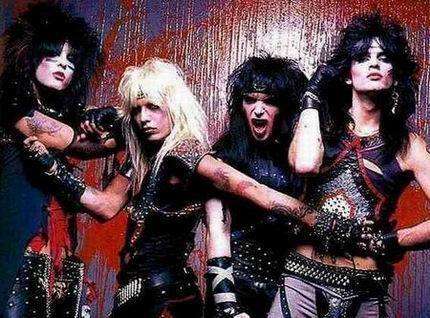 The 80´s “Sleeze Rock” also had its share of it. 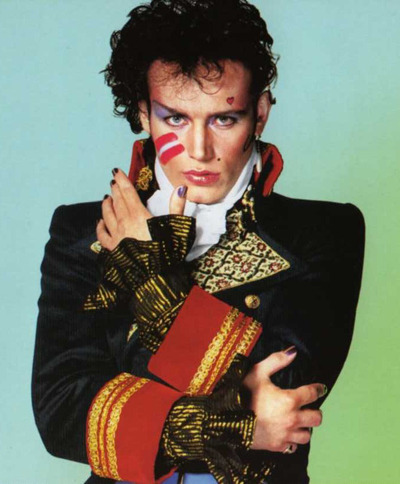 Adam Ant (above) was/is my favorite! 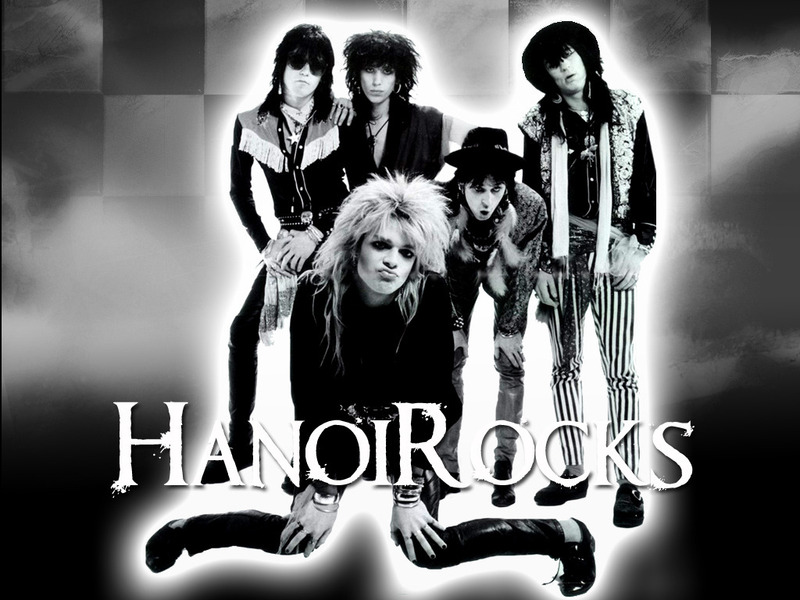 David Bowie, Marc Bolan (T-Rex) and Hanoi Rocks, Mötley Crue…. 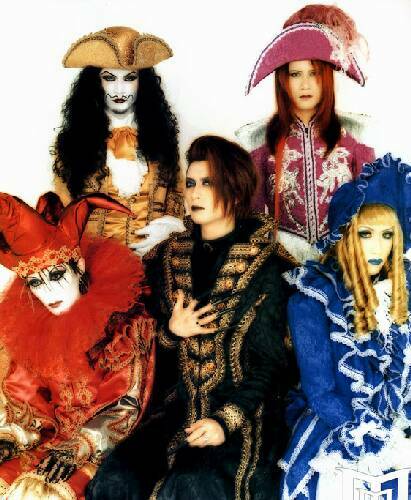 Bands like Malice Mizer and Seremedy (below) are merely following a tradition as old as rock itself. 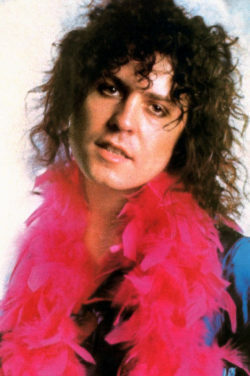 As a matter of fact, androgyny was even part of the 1920´s jazz scene……..so if it upsets you…..???? For Bowie fans outside of the UK, BBC4 documentary. Includes rare clips. ghout his career. 1969’s “Space Oddity” depicts an astronaut who casually slips the bonds of the world to journey beyond the stars. 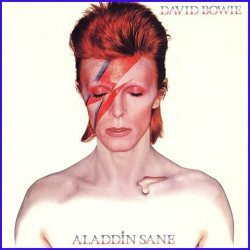 In the 1980 song “Ashes to Ashes,” Bowie reinterprets Major Tom as an oblique autobiographical symbol for himself. Major Tom is described as a “junkie, strung out in heavens high, hitting an all-time low”. This lyric was interpreted as a play on the title of Bowie’s 1977 album Low, which charted his withdrawal following his drug abuse in America. A short time later, there is another reversal of Major Tom’s original withdrawal, turning ‘outwards’ or towards space. Behold… the Originale music video for the David Bowie song Space Oddity from Bowie’s promotional film, ‘Love You Till Tuesday’, originally released in 1969 and re-released on dvd. I’m very proud to be able to share this rare, unique and ‘odd’ version of the video and song itself, as I think it’s the only one on the whole internet. So, enjoy this piece of film space gold and vintage anti-special effects. I actually knew a girl who was present when this was shot (long story)! 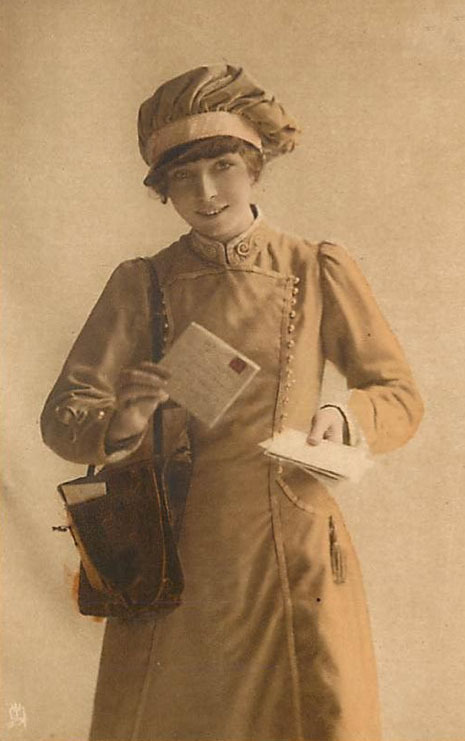 “My Postman,” a postcard by Raphael Tuck & Sons. The Castaways are an American frat/garage rock band from the Twin Cities in Minnesota. 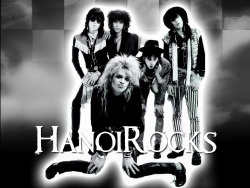 Their first and only hit single was “Liar, Liar“. 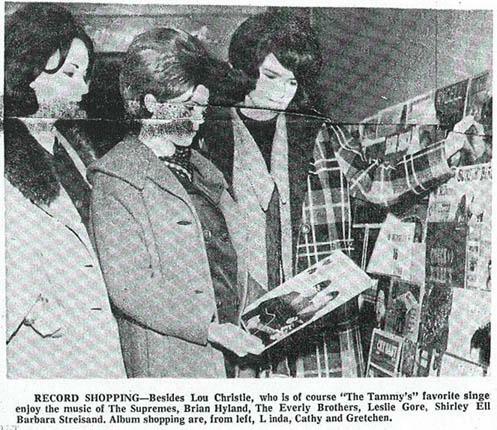 Written by band leader James Donna and Denny Craswell, produced by Timothy D. Kehr and released by Soma Records, it reached number 12 on the Billboard Hot 100 chart in 1965. “Liar, Liar” is featured in the films Good Morning, Vietnam and Lock, Stock and Two Smoking Barrels. The Castaways may be seen performing “Liar, Liar” in the 1967 beach movie, It’s a Bikini World. 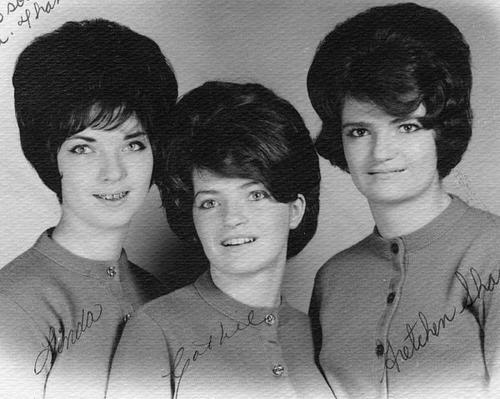 Their followup, “Goodbye Babe” was another local hit, but did not become a national hit. The song is noteworthy for the scream that precedes a guitar-led instrumental segment between verses. … is a style i really love! Clubbing in my hometown (Gothenburg, Sweden) in places with an industrial look (and often combining Cybergoths, Goths, Fetish people and other wonderful freaks ) is an experience i miss a lot. Personally i prefer the pounding, monotonous industrial type of music to more “bright” rave. 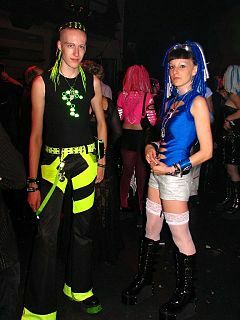 Cybergoth neon fashion under anightclub black light. “ Today cyber goths tend to wear primarily black clothing with hints of neon colors, as well as clothing made of reflective materials and PVC, and huge platform boots. 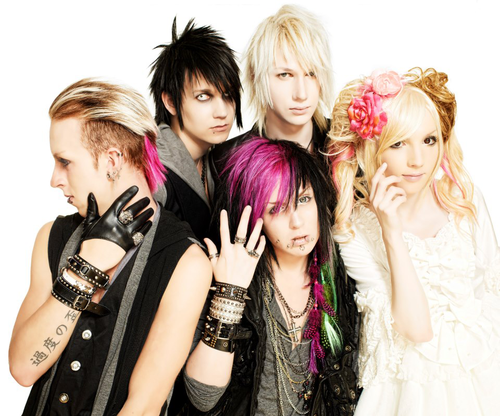 Their hair extensions or falls often incorporate a bright color and multiple piercings are typical. Goggles are often worn. Some cyber goths also wear gas masks or (in what appears to be a kind of medical fetish) shiny PVC doctors’ masks. Nancy Kilpatrick indicates that David Bowie‘s look in the 1970s is the initial inspiration for the style, and that Fritz Lang‘s Metropolis provided the prototype for cyber aesthetics.Kilpatrick also notes a link to cyberpunk science fiction, particularly William Gibson‘s Neuromancer. 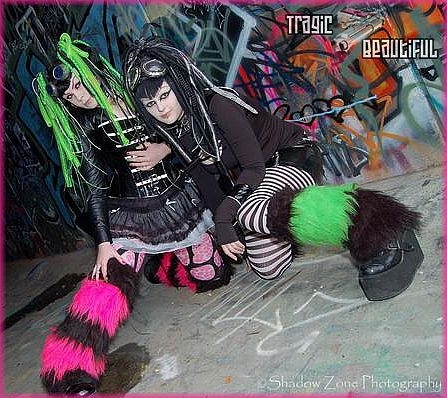 Cybergoth fashion combines rave, rivethead, and goth fashion, as well as drawing inspiration from cyberpunk and other forms of science fiction. Androgyny is common. The style sometimes features one starkly contrasting bright or neon-reactive theme color, such as red, blue, neon green, chrome, or pink, set against a basic, black gothic outfit. Matte or glossy black materials such as rubber and shiny blackPVC can be mixed and matched in an effort to create a more artificial look. 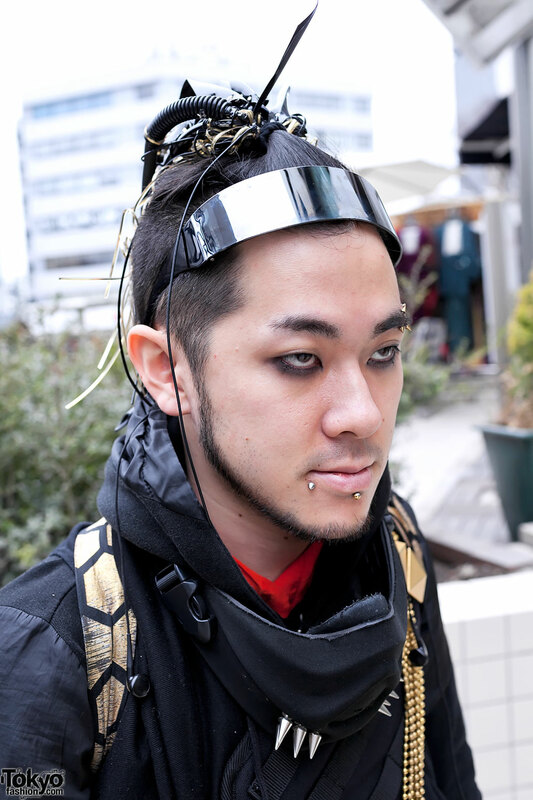 The black-and-monochromatic juxtaposition can take a variety of forms, including brightly colored hair and make-up, cybernetic patterns such as live LED circuit boards, body modification, gas masks and goggles (especially aviator-style), typically worn on the forehead or around the neck rather than on the eyes. The most common use of a theme color is in the hair or eye make-up. Artificial, extended hair or “falls” are sometimes used to create this added effect. Falls can be made of various materials, ranging from yarn to fluorescent tubing to electrical wiring. Popular club gear for cybergoths includes tight black pants, tight black vests or shirts cut from ripped, solid or fishnet fabrics, resembling costumes from 19th Century Gothic novels or early black and white horror films from the mid-20th century. Companies that specialize in the style include Cyberdog, DANE in London, Pen & Lolly Clubwear based in Sheffield (UK), Lip Service, based in Southern California, Robotic Kitty Fashions which specializes in custom, made to order cybergoth gear, based in Chicago, and Diabolik, a shop in Montreal. More Goth than Cybergoth. Personally i think there should be a Cyberflapper genre by now. 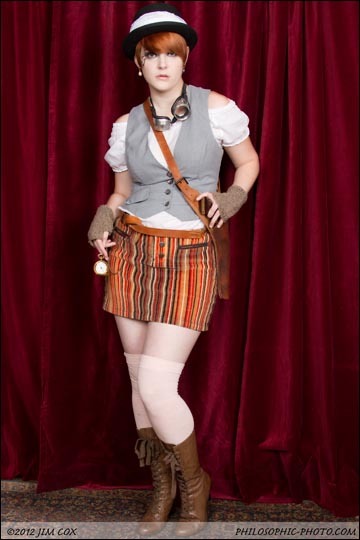 I have reblogged some wonderful Steampunk. I just wanted it to show in my categories in case someone is looking for it.